Bones of the hand and wrist (sometimes called simply hand bones) are part of the appendicular skeleton which includes the hands, arms and shoulder girdle (clavicle and scapula) and the feet, legs and pelvic girdle. 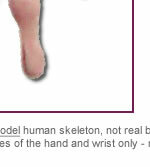 See also the whole human skeleton. The following labelled diagram of the anterior view of the right hand includes the hand bone names with links to more about the individual bones. This is about the level of detail expected for most first-level courses in human biology or anatomy & physiology e.g. A-Level Human Biology, ITEC Anatomy and Physiology or similar entry-level courses for careers in health sciences. Most of the bones in the upper-limbs (arms) are in the wrist and hands. The hand bones may be studied in more detail due to their complexity, while study of the arm bones may include more about the muscles attached to different parts of the humerus, ulna and radius and the actions of those muscles. This consists of eight small bones called carpal bones that are arranged (approximately) in two rows of four. The flexibility of the human wrist is partly due to this arrangement of many small bones - each of which articulates with several of the others, i.e. all of the others that surround it above, below and to either side. Note that the arrangement shown in the above table is an over-simplification. The positions of these bones are represented more accurately in the diagram at the top of this page. 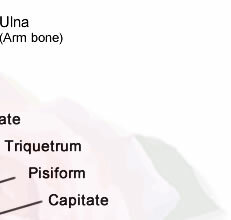 However, remembering this table can help students label bones correctly under time pressure. 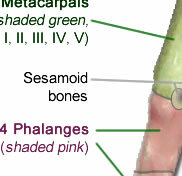 The carpal bones are named according to their shapes. That doesn't much help with learning to draw simple diagrams of the wrist bones but it can be useful for identifying the individual carpal bones in isolation. 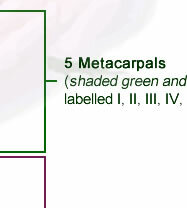 The skeletal structure of the metacarpus consists of 5 metacarpal bones (shown shaded light green in the diagram at the top of this page). The metacarpal bones are 'long cylindrical bones' (see types of bone) and are labelled I,II, III, IV and V or sometimes 1, 2, 3, 4 and 5. Metacarpal I (or 1) is the metacarpal bone to which the thumb is attached. This bone ('metacarpal I' = 'metacarpal 1') is sometimes called the pollex. a distal head -the slightly bulging part of the metacarpal bone furthest from the wrist. The 'heads' of the carpal bones are commonly called 'knuckles' and form the bony protrusions visible when the hand is clenched into a fist. The phalange bones in the hand are the finger bones (bones of the fingers - and thumb). The word and expression 'phalanges' and 'phalange bones' are plural. The singular word for one of these bones is a phalanx. a distal phalanx (furthest from the wrist). 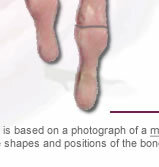 Note: The information above used to be on the page 'Skeletal Structures of the Feet and Hands' in the form of simple labelled diagrams of the leg and foot and arm and hand. That has moved to https://www.ivyroses.com/Holistic/Reflexology/Bones_Reflexology.php.